Wash rice and drain. Put into saucepan with water and bring to the boil. then turn heat very low, cover pan tightly and steam for 15 minutes. Mix ¾ cup of the coconut milk with ½ cup of water in a small saucepan and heat without boiling. Add to rice, stir gently with a fork, cover and steam for 5-10 minutes until coconut milk is absorbed. Leave to cool. Season chicken with salt and pepper. Heat oil in a wok or medium sized saucepan, and fry the garlic and curry leaves for 1 minute. Add ground spices and trasi and fry, stirring, for a minute longer, crushing the trasi with a spoon. Add the chicken and fry until the colour changes and it no longer looks raw. Add reserved ¼ cup coconut milk and simmer uncovered on a low heat until well cooked and quite dry. Add lemon juice to taste, check seasoning and add more slat and pepper if required. Cool. Take a large tablespoon of rice and flatten on a piece of banana leaf till 12mm (½ inch) thick. Put a good teaspoonful of rice of the filling in the middle and mould the rice around it into a cylindrical shape. 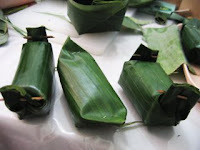 Roll up in the banana leaf and secure with wooden toothpicks, or roll in the foil to make a neat parcel. These parcels can be heated over a barbeque or steamed for 15 minutes, then allowed to cool again. They are served at room temperature as a snack. Hi Juandy, thanks a lot for adding my Blog, I just added urs. I wanted to make one request. Can I share one of ur recipes with my readers? I will put ur name and blog link in that post. Let me know if its ok.
HI Juandy, Ijust posted Ayam Bakar Padang on my blog with your blog link. Thanks for this recipe. I defintely will try to make it. People who come to our restaurant (bandungrestaurant.com) who have been to Indonesia always ask for lemper, but we don't have them in our menu. Thanks.